I have always loved watches, especially men’s watches for women or just the bigger ones in general. I don’t know why, maybe because I have a very small wrist but I guess I like the contrast. Recently I was approached by the Daniel Wellington Watch Company to collaborate with them and I am super excited to share with you some of their collection. Ever since I have started my blog, I have been contacted by a number of companies to collaborate on a story, but I have always been cautious to saying yes. I like collaborating with companies when their product and branding is a fit for my look. I always ask myself two questions “would I wear it?” and “would my customers wear it” even if we were not collaborating. 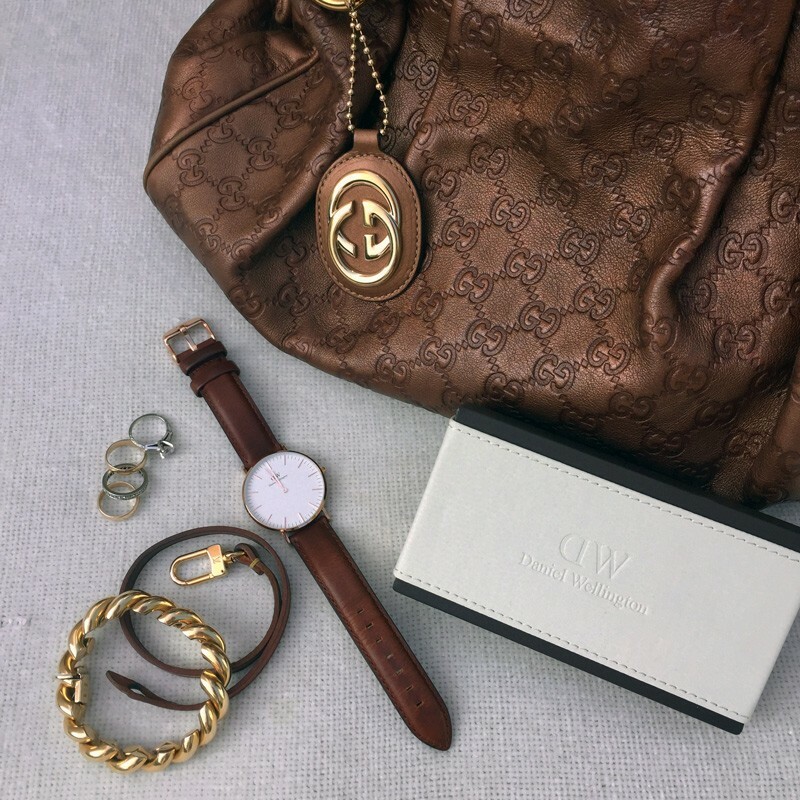 I think it’s really important to be honest when representing a brand and I honestly love the products offered by the Daniel Wellington watch company, its a great look with women’s jackets. Their signature look is a classic watch face, thin, refined and perfectly round and they are offered in a variety of different genuine leather or their “Nato” stripe straps which originate from the British Navy. I chose their Classic St Andrews Lady’s watch which has the tan leather strap. This is one of my favorite colors and I always look for shoes, belts and bags in this color to match. Tan has a more casual look and works perfectly with denim. I decided to wear my watch over the weekend for a casual outing. It worked perfectly with my classic hounds-tooth plaid Zara blazer, my favorite jeans and my bright orange scarf for some color. As you have noticed from my blog stories before, I love wearing jewelry and watches fall in the jewlery category as well. Just as I like mixing a lot of necklaces together to make a new look, I also love pairing my watch with great bracelets and rings. So I added my Louis Vuitton tan leather bracelet that wraps around my wrist and one of my favorite gold bracelets to add some more interest. Last but not least because of my collaboration with Daniel Wellington, I am super excited to say that you can get any item from their web site with 15% discount by entering “jacketsociety” code at check out. This offer is good until November 30th, so its great timing for the holidays. Their web site is www.danielwellington.com. I hope you take advantage of this great offer, with the holidays coming they make a great gift for a loved one. Below you can see a great video about the company. What do you think of this look and mostly what do you think of the watch? – See their behind the scenes photo shoot video below. Love the whole look, very classy. The watch is beautiful, just my style. Very happy I found your website. Thank you so much for stopping by! I hope you take advantage of the disount they are offering through us. Love this look! I love the way the orange scarf brings out the orange in the jacket! How do I order that jacket and scarf? That jacket was not one of our own jackets. It was my own blazer that I bought from Zara two years ago. The scarf is also old and we do not have it any more. I am so sorry but this post is from two years ago. Thank you for stopping by and check out our jacket selection in our shop. We will have a very similar blazer to this one that will be available next week. You suit orange beautifully! I’m wondering how you’ve tied your scarf? I’ve tried so many times to tie my scarves but I never seem to get it right?! Your watch is classy and elegant. You look great! Thank you very much, orange is one of my favorite colors. As far as the scarf I just turned it around my neck once and pulled it down, real simple. This is how I usually like wearing scarves. I love bigger watches too. I often buy men’s watches instead of women’s. This one is just perfect in its simplicity. And that blazer is beautiful! Thank you so much, I love men’s watches and own quite a few of them as well. I adore everything in your outfit Nora! That watch is spectacular – I too love an oversized men’s watch look and the saddle color is my absolute favorite. The orange scarf paired with the jacket and saddle colored accessories is right up my alley. Beautiful!! Thank you so much for stopping by, I love saddle color leather too so obviously that was my first choice. Hi Nora, just got back from a trip. I love everything about this. I just bought a tweed blazer with fall colors. I love this checked one and how you took the orange and let it stand out with the scarf! If I looked as good in jeans as u , I would wear them all of the time. Love it with the bronze accessories as well. Looks wonderful! Thank you so much, I can’t wait to see you style your new tweed blazer! i love that blazer and the orange scarf complements that blazer perfectly! I’m with you Nora, I like a bigger watch. I will definitely give a look at Daniel Wellington because I’m needing a new watch. I really like the orange scarf on you – so pretty – the whole outfit is stunning! Love this watch! I found your blog from The Mummy Chronicles link up 🙂 I’m also a fan of a big watches on my small wrists and have been known to borrow hubby’s. Thanks, I hope you check out Daniel Wellington website and take advantage of the 15% discount for the month of Nov with “jacketsociety” code. Thank you so much, orange is one of my favorite colors! Love that watch. It’s classic and timeless. I can’t say I was a big wearer of watches…but that did change fairly recently when I purchased a gorgeous Olivia Burton watch. Now it hardly ever leaves my wrist. Love your outfit! And especially like the scarf, did you get it from India (I’m Indian)? It’s got Hindi prayer written all over it. I didn’t get that from India, I especially loved the writing on it but I didn’t know its a prayer. Thanks for stopping by and letting me know! Great watch! Such a classic piece! Love your orange scarf! This whole outfit is amazing! So classy and chic and fun too! Great watch! Also in love with that bag and the fun orange scarf! That watch would go with so many pieces, it seems very versatile. 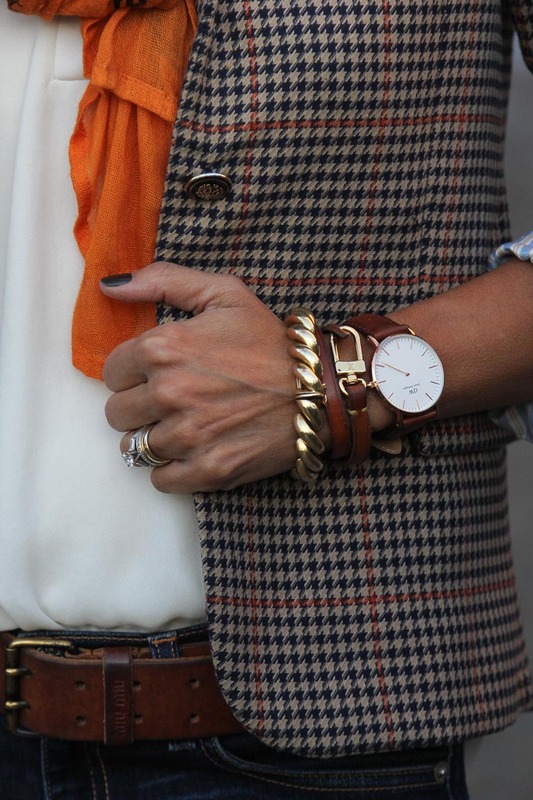 I really like how your houndstooth jacket has some orange stitching it it, it goes great with that orange scarf… AND, the blouse is so cute untucked in the back in the last few pics! Another gorgeous blazer and scarf. You are the queen of looking chic wearing jeans while wearing a blazer. Love the stack of bracelets, also. Thank you so much, I hope you have a wonderful weekend as well! Such a gorgeous look – a perfect mix of classy chic! Thank you for sharing on TBT Fashion link up. Have a great weekend! Your outfit is perfect and the watch is just my style. It’s only recently that I have been going crazy over bigger watch. Your watch is so classic yet can easily be worn with a casual look! You carry it beautifully! Thank you so much, of course I can follow you on bloglovin! love the classic houndstooth! fall fabulous. I keep seeing these watches everywhere. They sound awesome! They are, you should check out their web site, thanks for stopping by! Can I steal your wardrobe? You always look so cute! And that blazer is fabulous! Loving my DW watch too – it really is the IT watch of the season! And your classic ensemble is the perfect look for it!! Aren’t they great watches, I love mine…thanks for stopping by! I love the earrings. Where did you find them? They were the little detail that tied it all together. Just found your page, love it. You are an inspiration! Thank you, this is an old post from 2014 and the blazer is old. Its from Zara and I still have it and love it as it is a classic but I am sure they don’t have them anymore. We will have a couple of blazers similar to this for fall in another month on our web site. Please check back.